Say goodbye to dry, boring and overly processed and hello to easy, fun and delicious veggie burgers and burritos from Sophia DeSantis. These next level veggie burgers and burritos are approachable for any chef, and Sophia's mind blowing flavor combinations are unlike any other you've ever had. All burgers and burritos are plant-based, gluten-free and refined-sugar free, and feature real, whole food ingredients, as well as side dish and sauce pairings. Excite your tastebuds and feel satisfied and nourished with the unique and internationally inspired combinations that bring to together flavors even meat eaters will enjoy. Recipes include Smoky Hawaiian, Tangy Black Bean and Chiles and Curry burgers to burritos like Crispy Cauliflower "Fish", Greek Orzo and Thai Burritos. 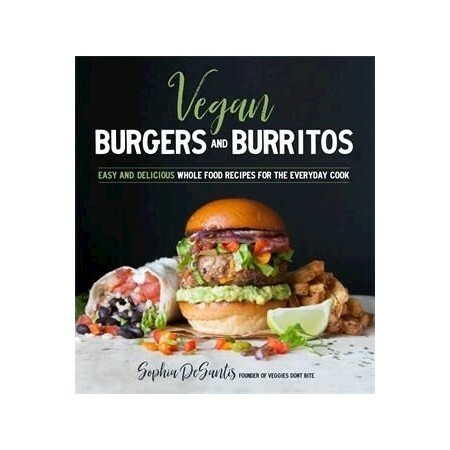 Sophia also includes notes on how to make some of the more exotic burgers and burritos accessible for kids and babies, and sauces like Sriracha Mayo and her coveted vegan sour cream recipe that she's been perfecting for years. This book features 75 delicious recipes and 75 mouth-watering photos. Sophia DeSantis is the founder of Veggies Don't Bite. She is a former teacher with her masters in education. Sophia lives in San Diego, CA.